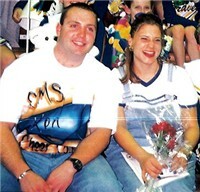 On Thursday, April 22, 1999 . . .
Elvia, Suzi, Ken & Nick judged CMS tryouts for Shairice's New Team. "They're just babies . . . look at 'em . . . uh huh, potential", Shairice said. With Cindy adding the score sheets, Shairice and I went over our notes after tryouts. Finally, around 12am the team was chosen and wow what a young team it was with 1-eight grader, 1-seventh grader, 5-sixth graders, and 4-fifth graders. Shairice and I talked about potential routines and formations and everything, until it was almost 1am. As we walked to our cars, she says, "loving you now and seeing you later", like she always did. I said, "yeah, I'll see ya on Sunday". With our car doors open and one foot in, she said, "I love you, Suzzz" and I replied the same. She smiled with excitement and said, "hmmmm . . . babies!" I nodded in agreement and then we drove off. I didn't see her on Sunday. Shairice was killed by a drunk driver Saturday night. Yeah, of course, Reece was coming to Lewis on Sunday for open gym to stunt around and I thought about cancelling, but all I could hear her say was, "Shoooot, cheerleading's about business". I called her mom and said I'd be right over. She said, "don't you have like 10 kids coming to Lewis today . . . they're depending on you . . . and your brother's baseball double header before that . . . come on . . . what would Shairice say?" 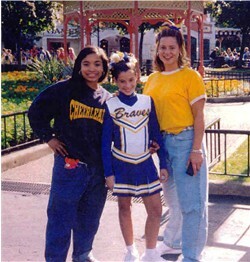 And we said it at the same time, "Cheerleading's 'bout business". Her mom told me to soak up those tears and get going. Life does not stop because of tragedy. That Sunday, cheerleading recruits came to Lewis for open gym, as planned. We threw up stunts and built some pyramids. This was their day to play with the team. I think we even had a good ol' elbow-to-the-nose bleed that day! 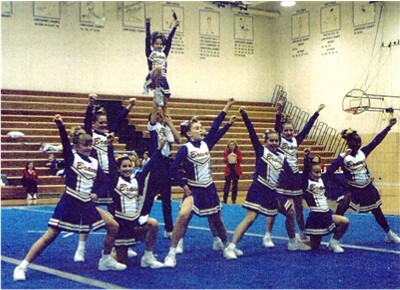 Some talented cheerleaders were at Lewis that day and a few were with me for years! With the help of Shairice's sister, Kel'ley, we had a routine for Great America! "Everybody's yellin', it's the news of the year . . . "
Kel'ley meant business - so what they're babies . . . "Let's do it again, do what I do, Again!" I think she had them all crying on the first day! Much love and thanks for her time and commitment! XOXOX . . . Muahhhh . . . K! Ken and Suzi coached Shairice's team that year. Here we are after qualifiying for State at Downer's Grove High School Regional. at the Oak Forest Regional! Here's Ken doing what he does best, entertaining the kids at State! CMS performs their State Competition Routine at Lewis University. point up to you, Reece! I'd like to see more, Click here to go HOME! Lewis Cheerleaders HOME, Click Here!